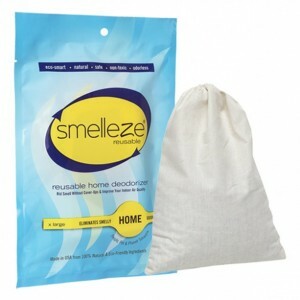 SMELLEZE Natural House Smell Deodorizer Granules: 25 lb. Bag Sprinkle on Odor Summary Often times the home could be invaded by offensive and noxious odors from pets, ashtrays, urine, feces, spills, chemicals, perfumes, diapers, mold, cooking, smoke, garbage, new carpet, paint and many other sources. Unfortunately, most ventilation systems only recirculate room air and remove large particulate matter such as dirt, dust, and lint. Noxious odors are left free to recirculate in the air you breathe. 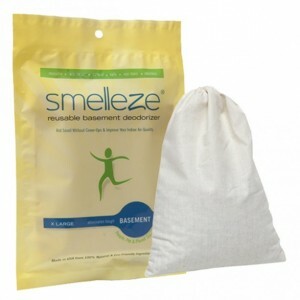 Features & Benefits • Sprinkle in room or on object & vacuum • Eliminates room smell without fragrances • Also absorbs harmful chemicals causing odor • Naturally non-toxic, non-caustic & odorless • Clears the air to make your home safer • Made in USA Powerful Deodorizer Eliminates a Wide Variety of Unpleasant Odors The Smelleze® Natural House Smell Deodorizer Granules and Powder is a natural product that was specially developed to fight all common household odors while controlling spills. If you are not sure what is causing your odor problem, this is the product to use because of its power to destroy a wide variety of odors. Smelleze® will cleanse your home of noxious odors and absorb spills so it smells fresh and clean rather then masking it with fragrances. To use, simply sprinkle on or in garbage, urine, bathrooms, animal stalls, kennels, manure, ashtrays, floors, carpets and sweep to eliminate odors and spills. Furthermore, this is a non- flammable product so it may be directly applied to chemical, gasoline and oil spills. It will reduce the explosive nature of whatever it absorbs, reduce the aggressiveness of acids in their liquid form and aid in the solidification of hazardous sludge. Smelleze® is non-toxic, safe, natural, odorless, non-flammable and non-caustic. 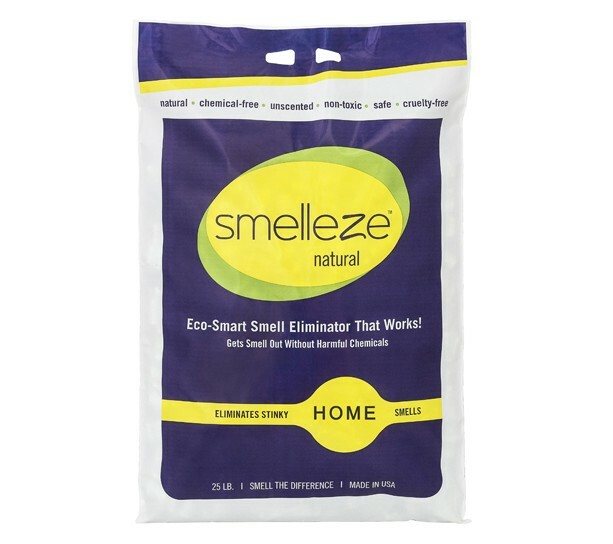 Smelleze® is an ideal environmentally friendly solution for eliminating stinky household odors and spills without adding pollutants to the air you breathe. It does not contain VOCs, harmful or ozone depleting chemicals and is especially beneficial for those suffering from allergies and chemical sensitivity. No fossil fuels are used in the production of Smelleze® odor control media.